I made a simple calf block for doing calf raise exercises. After seeing metal ones sold online for $45 and up, I decided some good old-fashioned do-it-yourselfing was in order. I decided to make an H design out of post wood for stability and strength. 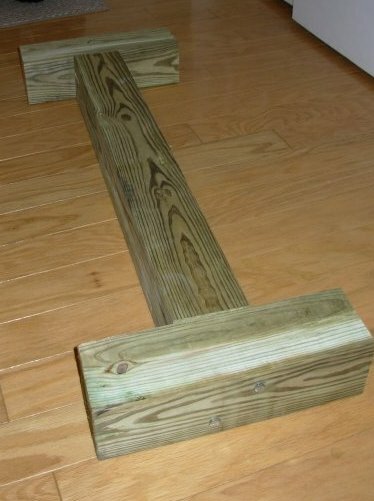 I bought a 4x4 inch pressure-treated post at Home Depot. Home Depot even made the 3 cuts I needed for free. I also bought 4 large lag screws. I drilled through the end piece of wood so the lag screw would go in easier. I screwed each end on with 2 lag screws in a diagonal configuration. Total cost of materials, about $9.50.